Lindsey Goodchild is the CEO and founder of Canadian startup Nudge Rewards. Unlike many of the founders TNW have spoken to during this series, Goodchild hasn’t got a technical background. But that hasn’t stopped her from launching a tech company that boasts clients like Samsung and Rodgers, and has raised nearly $7 million from investors since 2012. She recognized that there’s a population of workers who deal directly with customers that often feel disconnected from management. These cashiers, servers, and frontline service workers do their jobs often without any feedback or recognition of their hard effort. “The majority of the world’s employees work on the frontline, interact with customers on a day-to-day basis, and yet do not have access to corporate email accounts or computers to get vital information. It became a problem that I couldn’t stop thinking about, and eventually, I started Nudge Rewards to address this communication gap head-on,” she explained. So, what’s Nudge Rewards? It’s essentially a two-way communication system between upper-management and floor-level staffers, which exists in the form of an app installed on the employee’s personal cell phone. “While we know that frontline workers typically don’t have corporate email addresses, the majority do carry a cell phone with them,” Goodchild said. 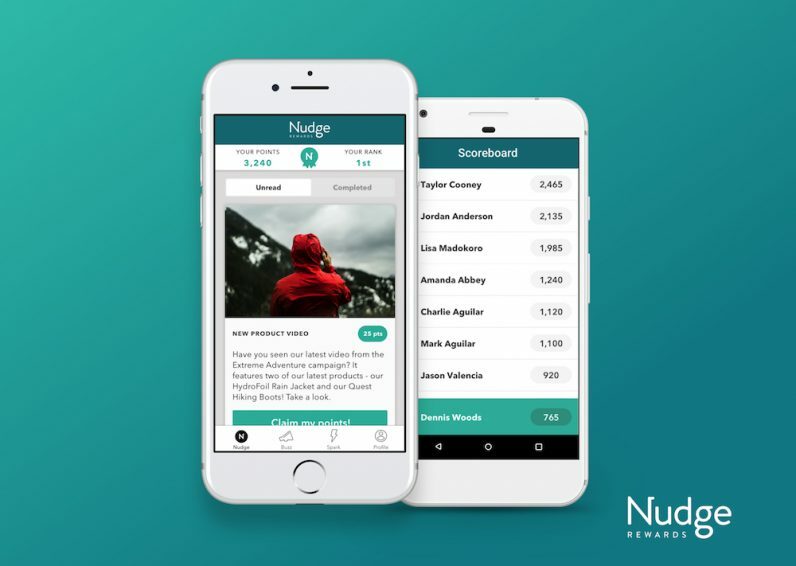 Nudge Rewards lets management educate, shape, and engage with their workers, through guidance and custom in-app learning materials. It also lets them reward their employees in visible ways, other than their salary. Employers can create challenges and goals for staffers to accomplish. Doing this earns points, and allows the staffers to rise through a leaderboard. This essentially is essentially a day-to-day, data-driven feedback system. Crucially, it allows management to identify the employees who are the most driven, and the most engaged. The idea for the service came about when Goodchild was working with a tourism client in the midst of a re-branding exercise. Nudge Rewards has been going from strength-to-strength. It now employs 25 people, works with some of the largest companies in the world, and is rapidly growing. Goodchild accomplished this despite the odds not exactly being in her favor. Just five percent of Canadian tech companies are founded by women, and only two percent of venture capital goes to women-led firms. But these pale compared to the broader challenges of launching a company, which are universal, and not intrinsically linked to her gender. She also notes that for female entrepreneurs, things are getting better. “There’s a lot of support for women in tech and entrepreneurs right now,” she said.